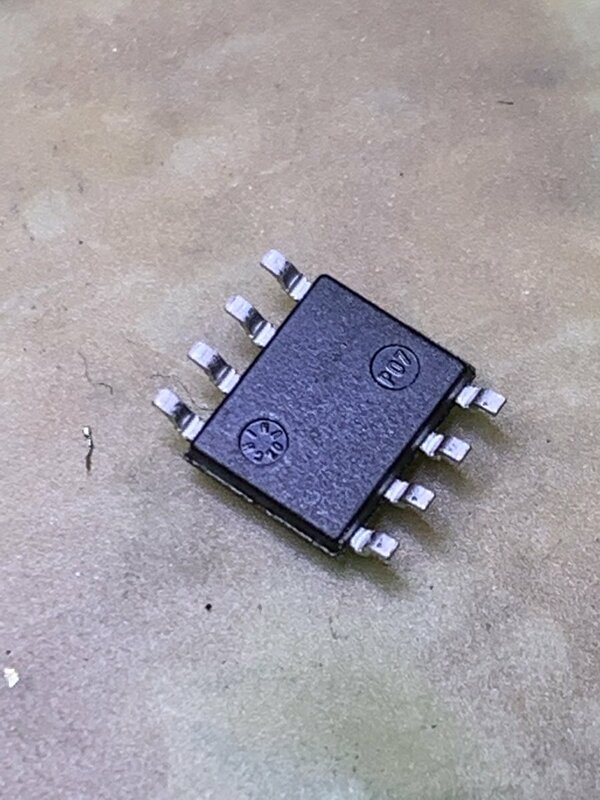 I bought some OP177G in SOIC8 on eBay. The strange thing about them was that while I bought 10 on the same piece of cut tape, the packages were different… I figured there was a high probability that they were fake. I decapped them using an Olfa cutter (box cutter) blade. All things considered this decapping process works surprisingly well. With some effort, I think you can do better (@marcan42 has used this method with reasonable results which is what gave me the idea in the first place). 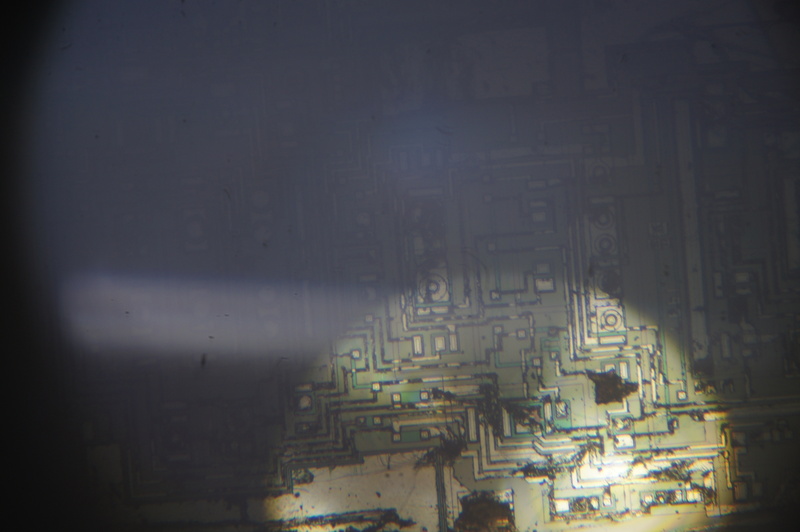 They were imaged under the same inspection microscope (Amscope) that I use for soldering. While the images are not great, the feature sizes are huge so it doesn’t matter so much. 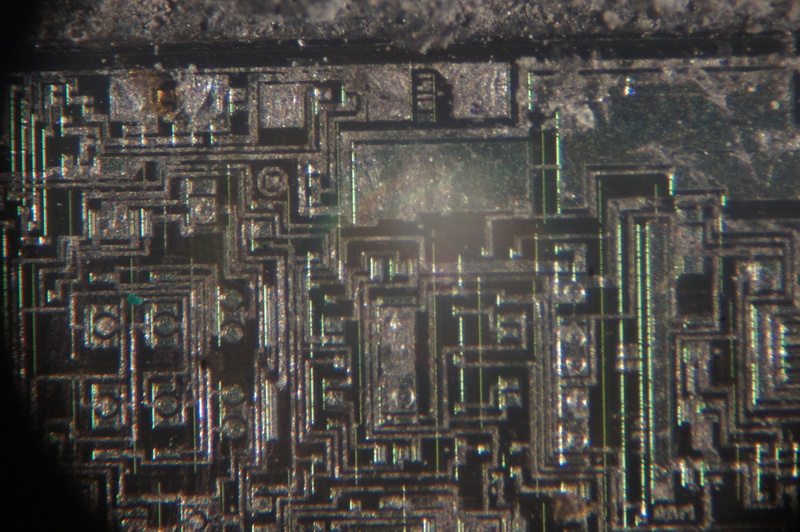 I also purchased some OP177s from Digikey… turns out that while the packages look kind of fake, the dies appear to be identical! The Keithley 2002 is an 8.5 digit multimeter. This puts it among the highest precision multimeters available. I’ve been curious about the ADCs used in these high end multimeters and have been looking over the Keithley 2002 ADC schematic. These are my notes. 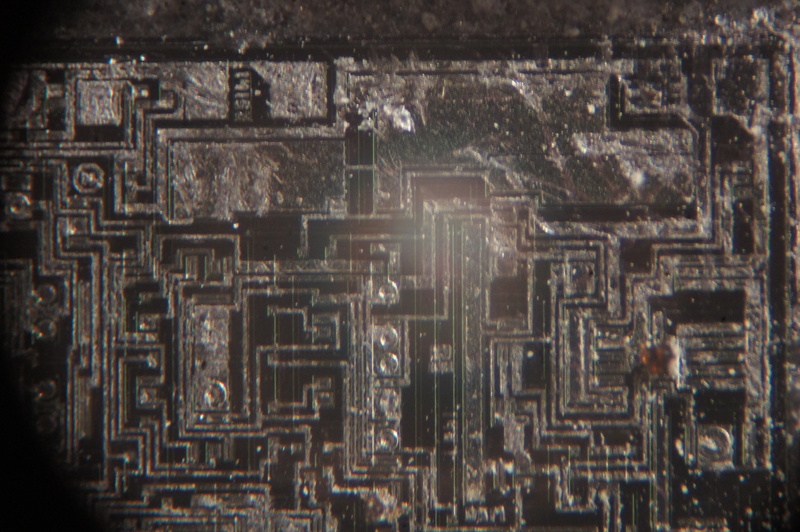 The schematic I used is from TiN. Originally this was hosted here but appears to currently be offline. A local copy of the schematic is here. 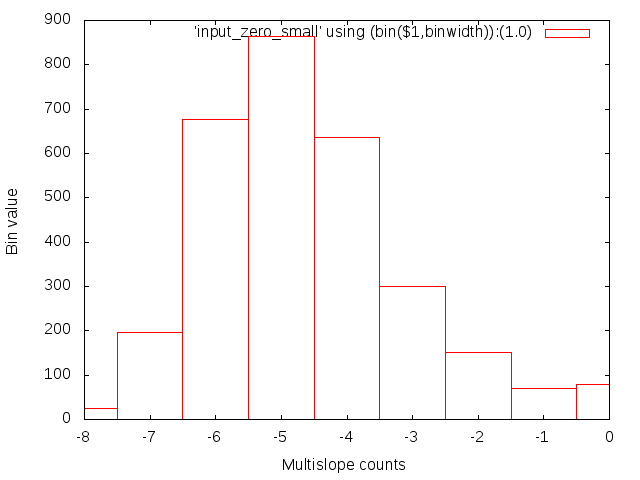 As far as I can understand the ADC is a dual slope implementation (UPDATE: it’s actually multislope, but the slow slope is always connected, see below). The slopes are driven by current sources of ~450uA (which are derived from a 7V reference). They are switched through a SD5400, and when not in use flow to some kind of current sink. The Keithley 2002 uses a 7V LTZ1000 reference (generally regarded as the best voltage reference you can buy). 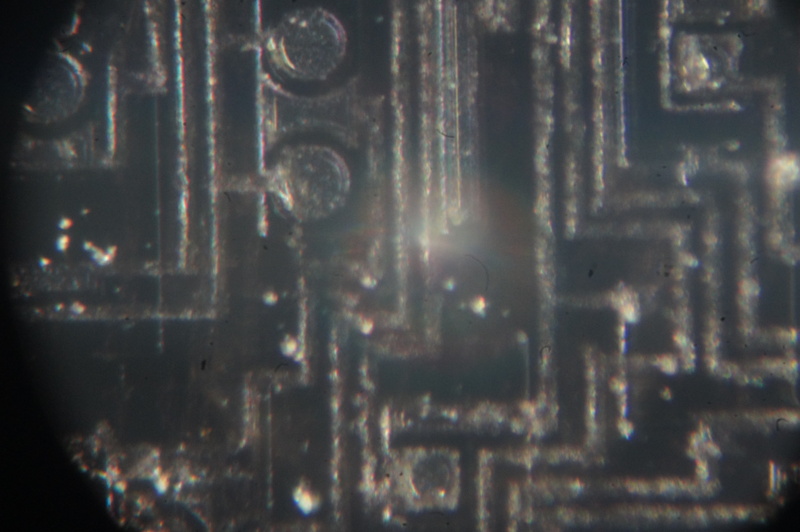 This enters the ADC board as a differential signal (REFHI and REFLO). REFHI should be 7V and REFLO ~GND. The REFHI is used to feed a non-inverting opamp (U801). 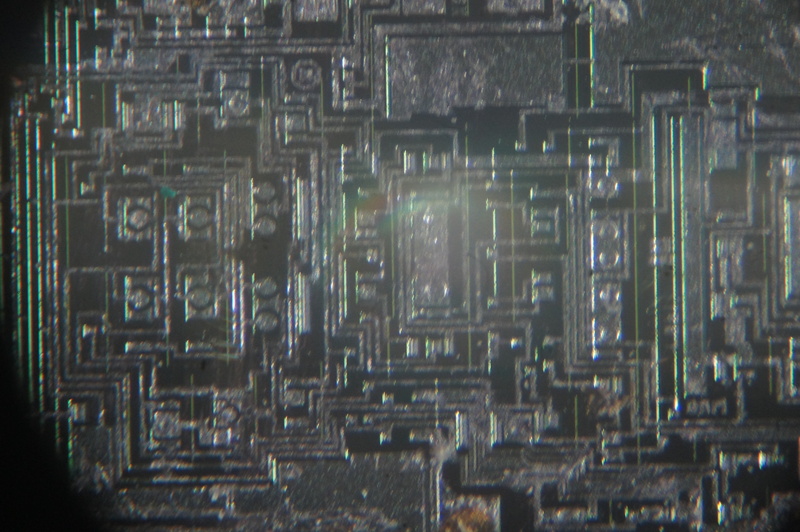 The opamp has gain of 1.666. 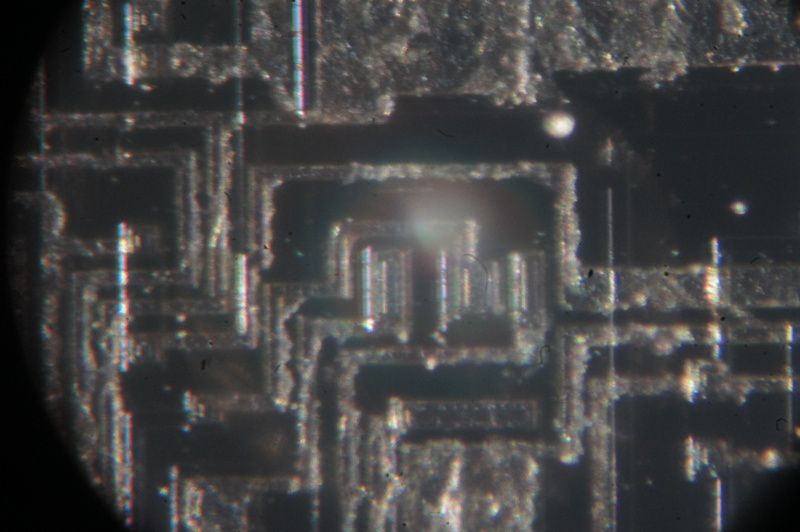 A tap is taken off the feedback network of U801 at ~2.333V. 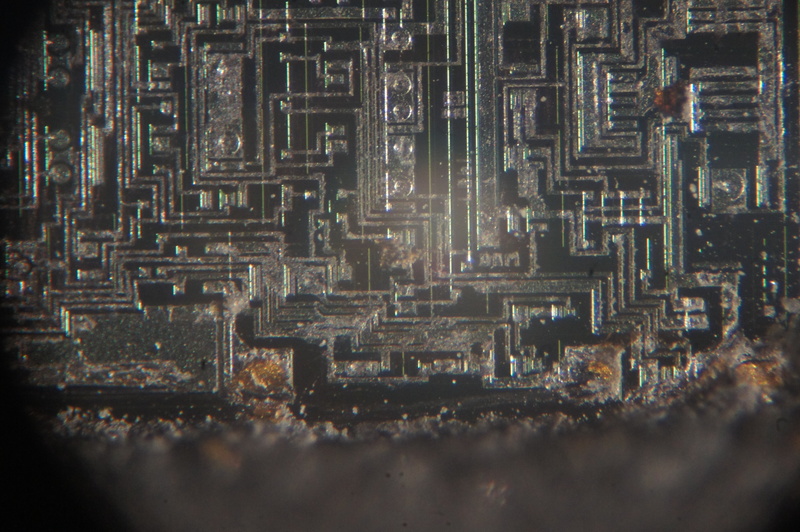 This is used as the reference for U816. 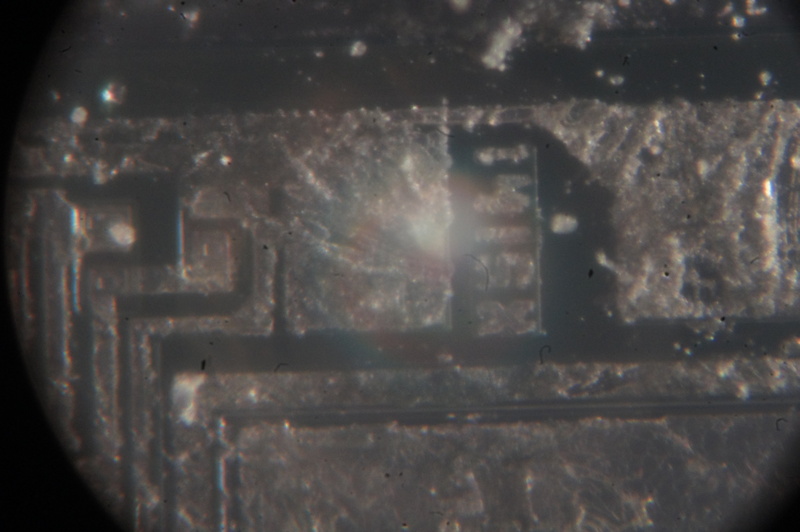 This opamp drives a JFET (Q805) such that 2.333V flows through it. Creating a current source. Setting the voltage through Q805 seems to set the current at ~-450uA. Rather than being ground referenced, the feedback network of U801 is connected to the virtual ground of U802. U802 is referenced to REFLO. 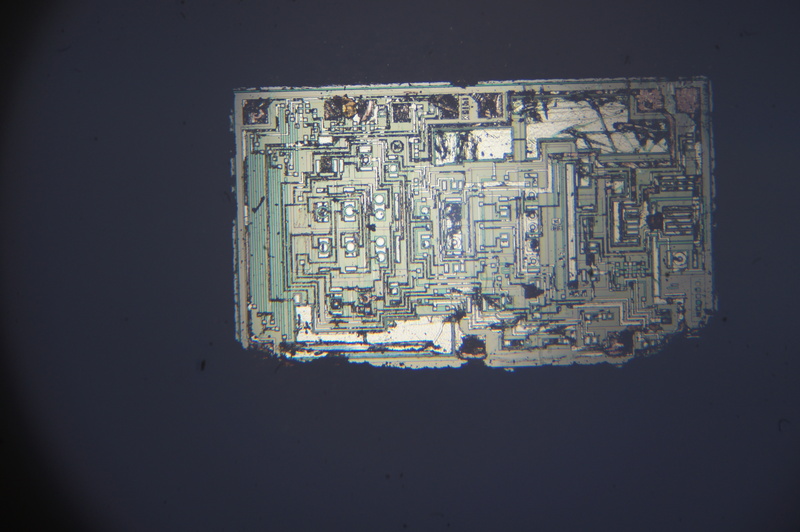 U802 is an inverting opamp. Again with a gain of 1.666. Again a tap is taken off the feedback network at ~-2.333V. This is used as the reference for a opamp driving a current source created by Q806 (similar to the above). Current though Q806 is ~450uA. The above therefore creates positive and negative current sources of +/- 450uA. These are the run down slopes of this dual slope implementation. 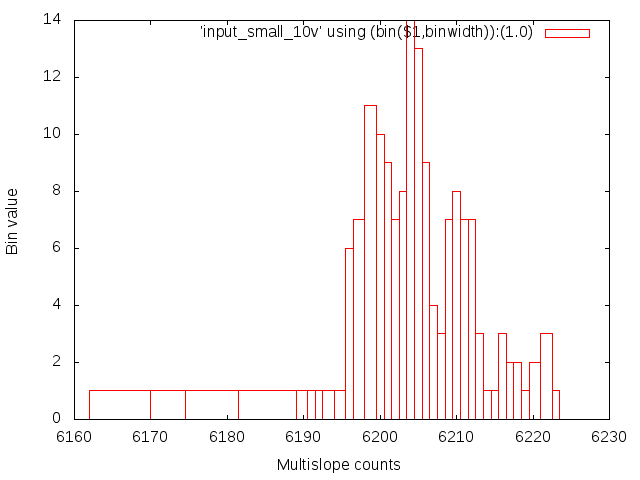 UPDATE: Kleinstein on the EEVBlog forums pointed out that there is a single slower slope which is always connected, delivering ~5uA. I assume this is what U815/Q807 are. 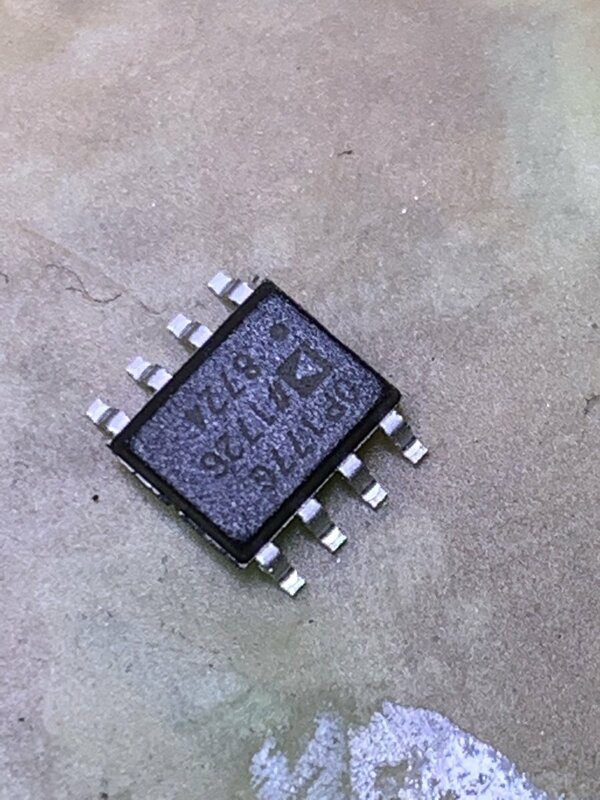 So this is in fact a multislope ADC, but the slow slope is always connected. The references are switched through an SD5400. 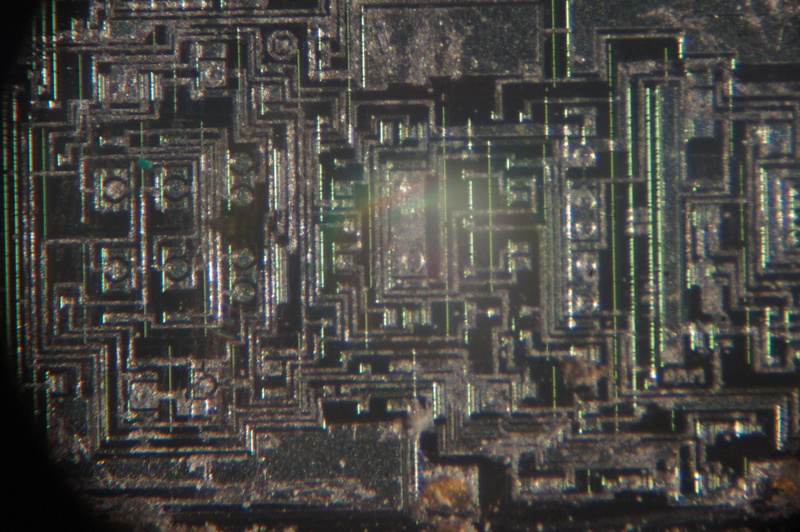 These are MOSFET switches. The Vgs threshold is ~0.1V. It is driven by TTL logic level signals (0,5V). This being the case, if the voltage coming from the current sources goes below -0.1V or above 5V it will not switch correctly. 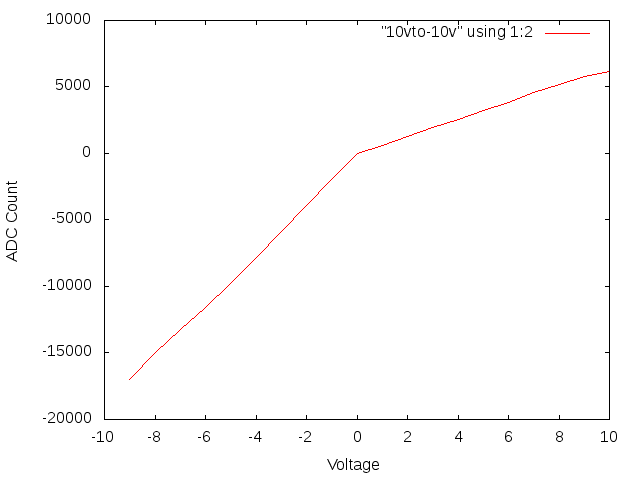 Because the current is so low (450uA), a load of >200Ohms would be required to generate a voltage higher than 0.1V. I assume that the integrator presents as a load lower than this. I’ve been playing with a multislope ADC design. 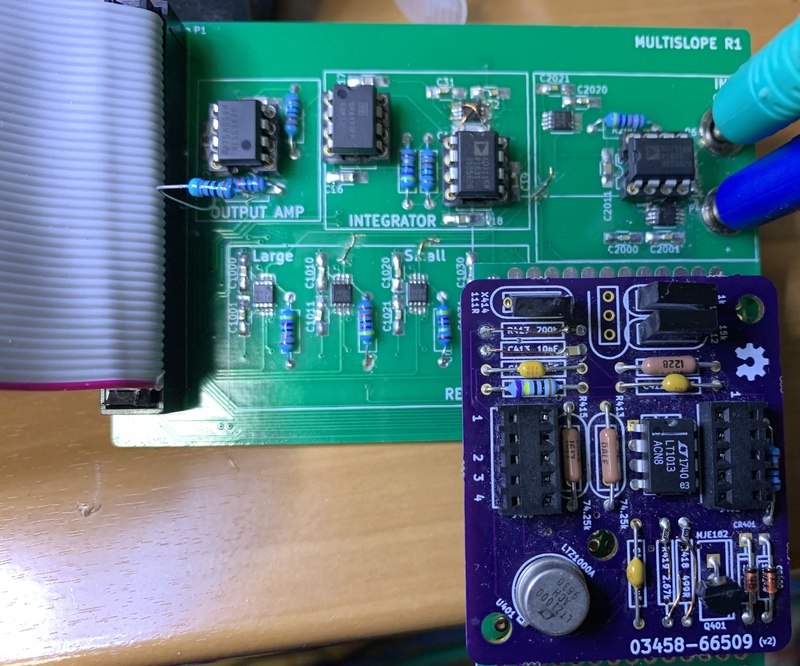 Multislope ADC are often used in high end multimeters, and as I have a mild obsession with 8.5 digit multimeters, I wanted to try making a multislope ADC. The current design, such as it is was developed with significant input from EEVBlog users (see this thread). 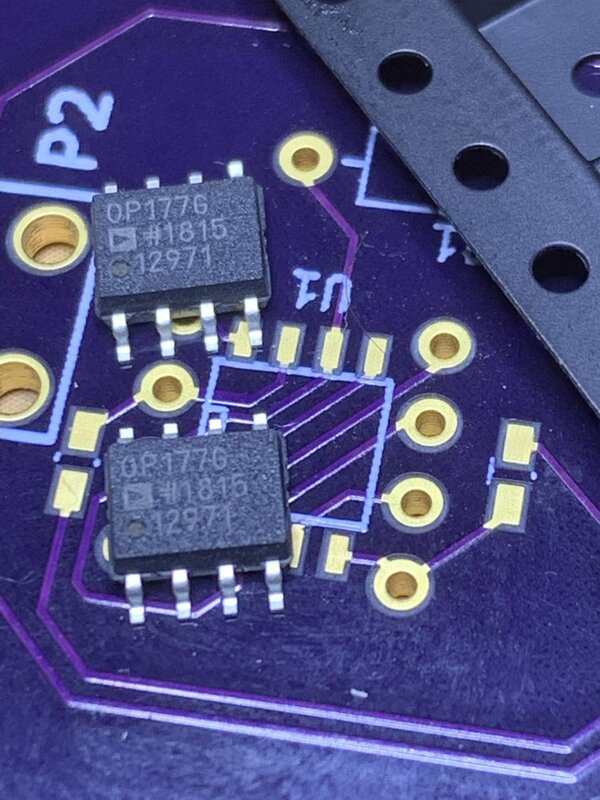 This post documents initial bring up and tests of the first revision of the PCB. 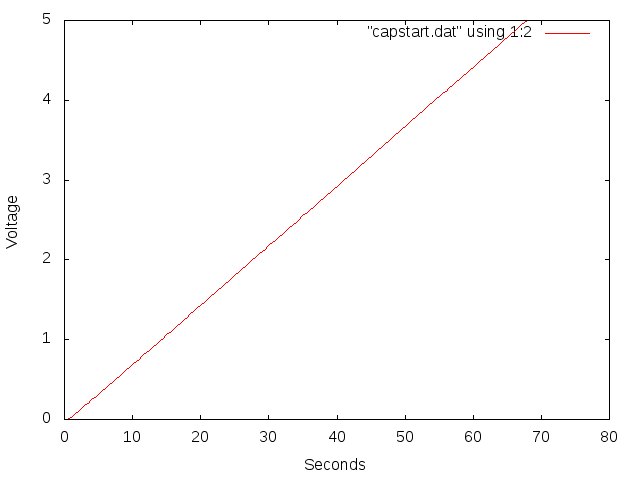 Links to Kicad files, and data used in plots can be found at the end of this post. All resistors are standard, cheap 1/4 Watt metal film resistors. The large slopes are 47K. Small slopes 4.7M. 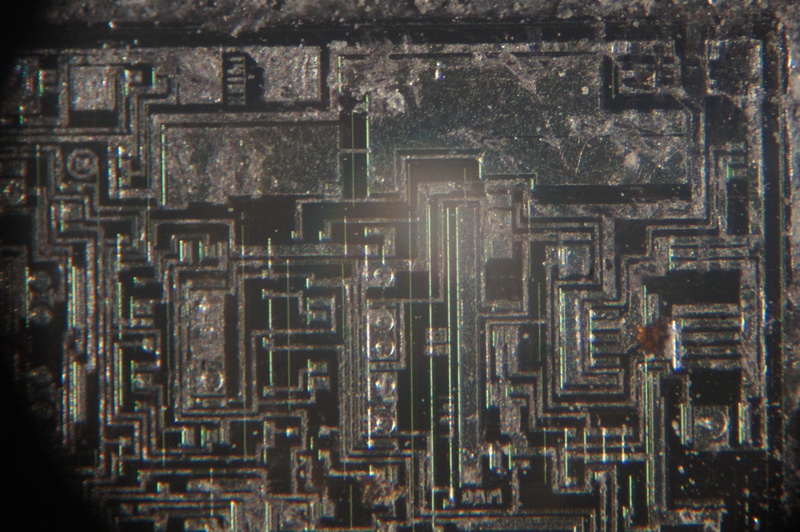 The input resistor (R200) is also 47K. The design uses a 2 opamp integrator. Notionally this allows you to combine an opamp with good low frequency response with one with good high frequency response. A voltage divider sits between the two opamps. R9 is 47Ohm, R8 1K. On the output amplifier R3 is 1K and R7 is 470Ohm to give a gain of ~0.5. This allows the Arduino Mega which I’m using to control the amplifier to read almost the full positive range of the integrator output (12V). 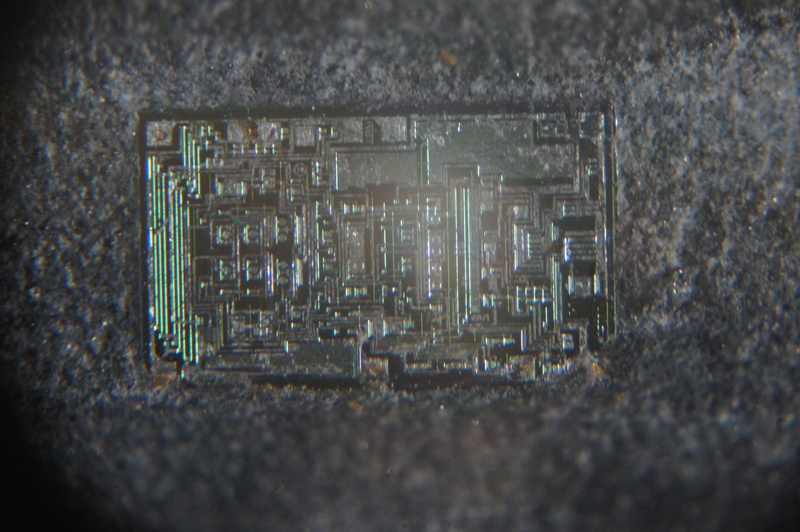 The integrator capacitor is an NP0 10nF, Murata GRM3195C1E103JA01D. The switches are all DG419s. 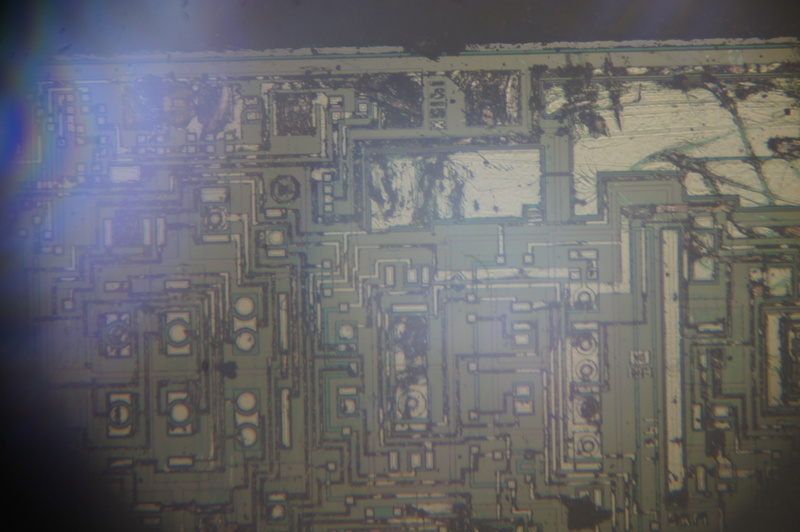 This includes the part marked DG417 on the schematic, which resets the integrator. All the DG419s are Vishay DG419Bs MSOP8s, except for the integrator which uses an Analog ADG1419BRMZ (I ran out of Vishay DG419s). Update: I attempted to rebuild this circuit using only ADG1419BRMZ, it did not work well. My guess is that there is too much charge injection… charge injection is not listed in the datasheets… I’m using a LTZ1000 reference to supply the slopes. 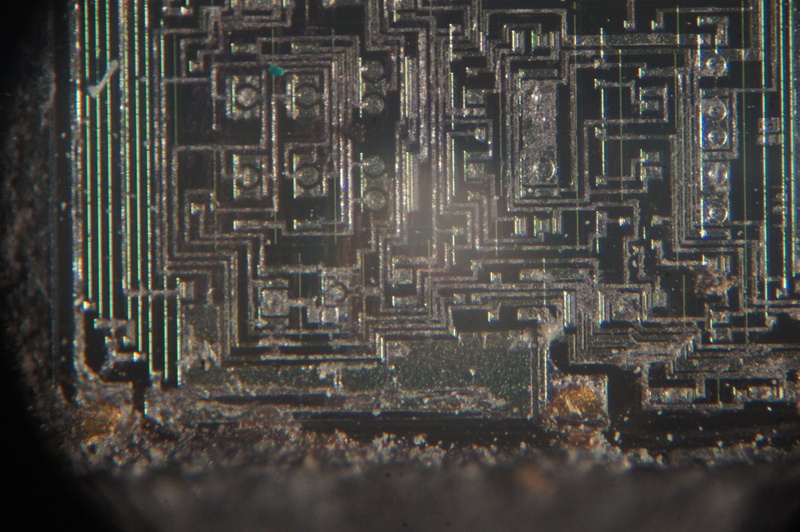 This sits on an 3458A A9 PCB. I’m using a A9 clone from here. All opamps are socketed. In this test I used a NE5534 on the output. 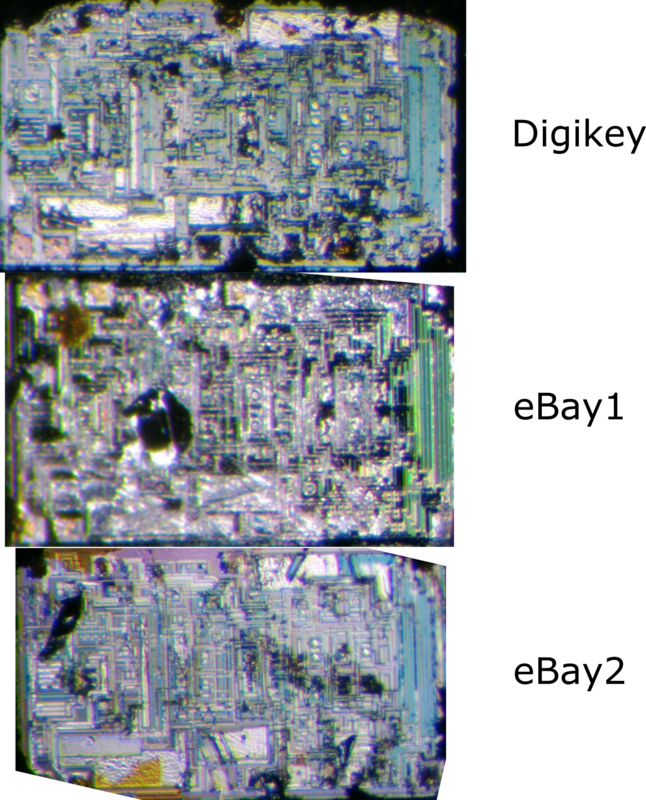 An OPA177 and AD711 for the integrator, an AD711 on the input, and an LT1013 to buffer/invert the reference voltage. The banana plug holes are too small for the sockets. 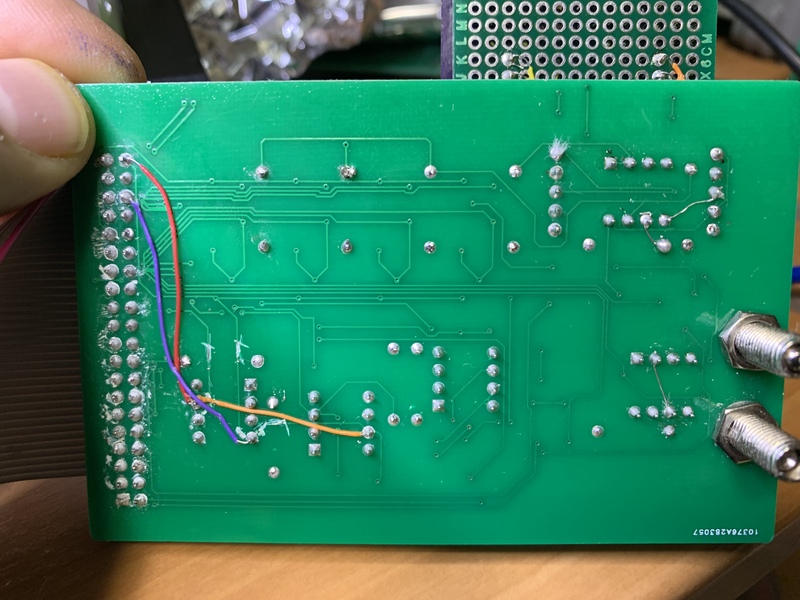 The input opamp was connected incorrectly (I forget the exact issue). The reference voltage buffer/inverter was wired incorrectly. The reference PCB covers the banana plugs when installed. 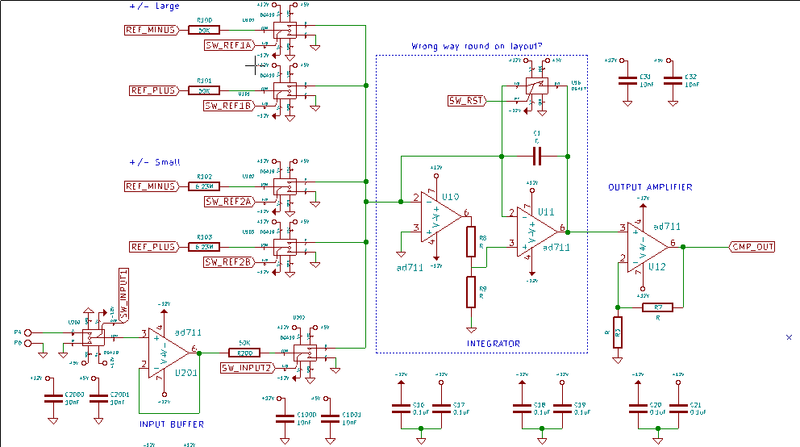 These should be resolved in the schematic, but I’ve not fixed the layout yet. 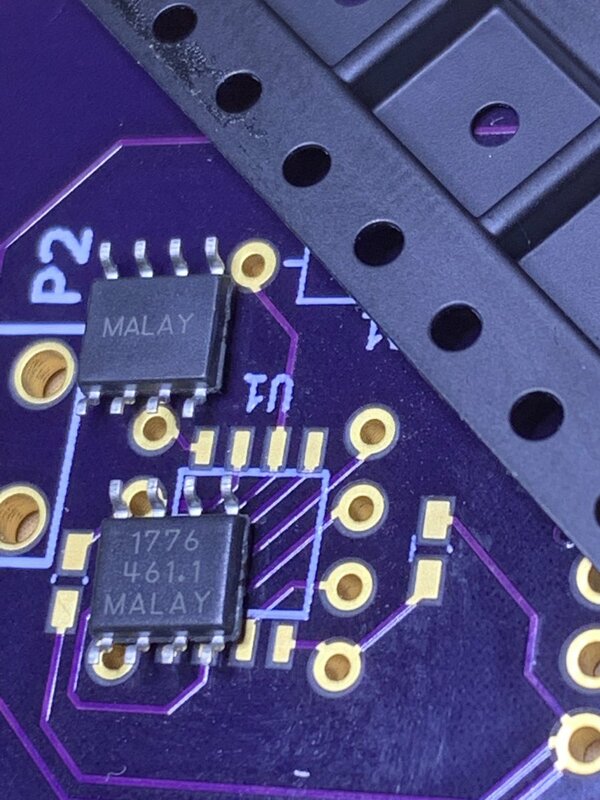 In the build you’ll also notice that I’ve hacked around with other parts of the PCB too. This was when I was cutting traces to try and figure out where leakage current was coming from and charging the integration capacitor. In the end this seemed to be coming from flux I couldn’t clean from under the DG419 switches. I removed, cleaned and replaced these, being more conservative with my usage of flux when re-soldering them. This removed most of the leakage current. I’ve written code to drive the ADC board in a basic dual slope configuration. This works for bother the large and small slopes. In the tests below however I’m using the small slopes only. Arduino code is provided in the notes at the end of this post. The tests use a DP832 to supply rail voltages (+/- 12 and 5V). A 33220A function generator is used to generate the input (this is probably not particularly low noise/accurate). 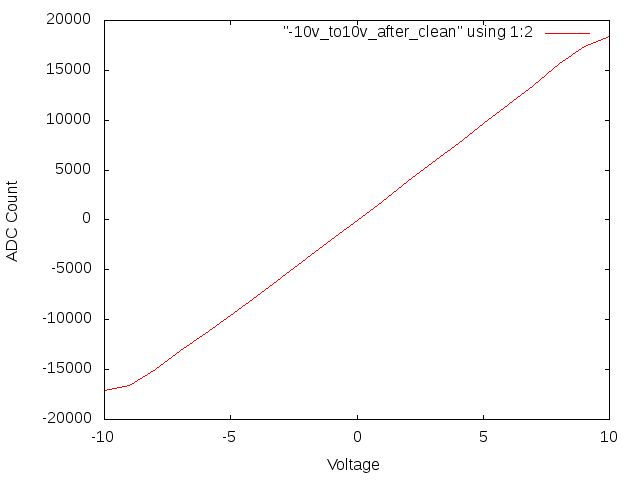 Integration of positive voltages is also about 3 times quicker than negative voltages. It’s not clear to me why this is. Positive and negative voltages use different reference resistors, however these don’t seem to be significantly different and I need to investigate further. Before moving forward, I’d like to better understand why I’m seeing this difference between positive and negative voltages. 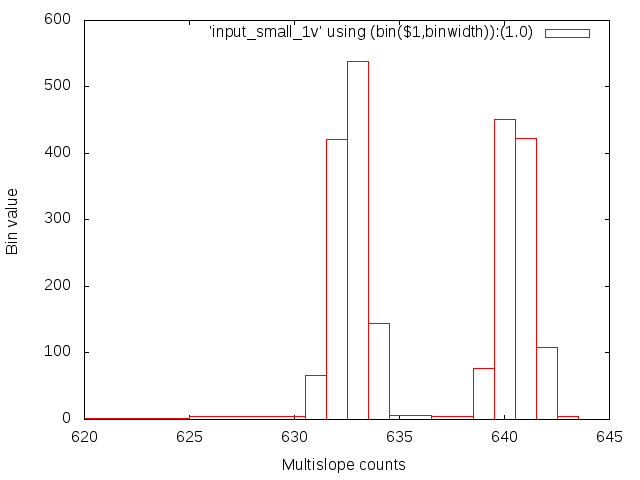 I should then be in a position to combine large and small slopes to create a multislope ADC. TDLR; Applying to YC is an interesting experience, and have a clearer process than many VCs. I would recommend it, even for solo founders and science-based startups. I applied to the YC winter 2019 batch. I viewed the whole process as relatively low probability. YC gets more than 5000 applications. Out to these ~500 get invited to interview onsite. My idea was for a cheap simple device to read/write DNA. I’ve blogged about my approach before here and here, you can find the complete YC application below. While I wasn’t accepted, I interview with YC a pleasant and worthwhile experience. My hope is that this post will encourage other science based startups and solo founders to apply to YC. As a solo founder, idea stage, science based startup I thought my chances were quite slim. I fired off the application anyway, as the investment of time on my part was relatively low. You don’t need a deck, and the focus seems to be on the idea and the team. This is in contrast to most seed stage VCs (even accelerators) who require a deck and likely multiple meetings. The other difference with YC is the timeline is very clear. Many VCs will keep you hanging, not reply, or ask you to check back in after some vaguely specified goal has been reached. It’s understandable, but can be painful. YC reply on a fixed timeline . This makes the whole process clearer to everybody involved. After putting in my application, I received an email a few days later requesting a phone screen. The phone screen was about 10 minutes. Quite high level, and mostly just clarified the play, and how it fits into the DNA sequencing space (see the application below if your interested in further details ). The deadline came and went, and I heard back the day after the official deadline that they’d like me to come to Mountain View to interview. YC cover your travel expenses up to a limit. Coming from Japan, the travel budget was 1000USD and hotel budget 350USD. The interview process itself was pretty painless. My interview panel consisted of 3 people. One had a background in Biotech and had in fact worked at a DNA sequencing startup. The conversation was good, they were very focused. They didn’t focus too hard on the technical aspects of the play. After discussing the play and initial focus, we moved on to talk about how I would beat the current market leader (Illumina). This wasn’t really the play, Illumina are very cheap on cost per base. But their cost per run is very high (500USD+). The idea was to focus on applications were a very low cost per run (10USD) would be beneficial, bootstraping on DIYBio and Synthetic Biology applications. My thesis is diagnostic instrumentation will likely require a cheap run cost… but throughput isn’t so critical for many applications. But they wanted to see the Illumina-killer play worked though. This is not unreasonable. While this might not be the pitch, I think it’s reasonable that I should have the idea worked through… I guess that I have the “idea maze” fully explored. In total the interview lasted about 15 minutes. I heard back later that evening that I didn’t make it into this batch. They gave detailed feedback (which you’ll find at the end of this post ), again this is something you don’t receive with most VCs. I was left feeling quite positive about YC. The process was very clear, and I think they can do a reasonable job of selecting and funding science heavy startups. They’re quite unique in a number of aspects. The goal seems to be to create an efficient pipeline for selecting startups that can increase their valuation from a nominal 2MUSD to probably ~20MUSD in a 3 month timeline (and eventually growing to unicorn size). After the 3 month period is up, you get put in front of a bunch of 2nd stage investors and the hope would be that you raise at this increased valuation. 500 startups are interviewed. From my experience I’d guess they spend <30 minutes evaluating each one. This isn’t enough time to do a deep dive, but it’s probably the point of diminishing returns. After this they have a strong enough signal, to filter 500 startups down to 100 which have a reasonable chance of moving forward. This pipeline likely works as well for science based startups as traditional tech. And I know that in my batch a DNA sequencing startup was selected, and will be following it with interest. As for me… I’ll probably put my startup on hold for now. The timing isn’t right for me to move to the US, and working on this idea would likely take more money than I have. If you’re doing a science based startup in Japan, or I could conceivably help out remotely, please get in touch! (new at sgenomics dot org). The interview acceptance came about a day late. Given the volume of applications they have I find this more than acceptable. I confirmed with YC that they are happy for me to share the feedback, so here it is! Unfortunately, we’ve decided not to fund Opusone for the winter batch. This was a close call for us. I was very impressed by your background in the space – we like to fund people who are deep technical experts and you certainly are. We also really like the general pitch of an “altair basic of genome sequencing”. If you’re not familiar with the term, there is a great essay Paul Graham wrote that I think fits very well with your core thesis. We had two issues that gave us pause. One, it was just very early in terms of either building the device or seeing if a device this low-end would actually be interesting to DIY bio people. And two, it wasn’t clear to us how the device would go from low-end to taking over the mid-tail and eventually taking over the market. Let me say a little more about the second issue. We’ve seen in past companies that it’s not inevitable that the low-end option ends up taking over the market. Sometimes it gets stuck as an educational tool, which tends to be a small market, as the high-end options continually drive costs down. If you’re pursuing a “altair basic becomes microsoft” strategy, you want to make sure that you have a clear technical path where you can start with a low-accuracy device but keep improving the accuracy until you have something that is competitive with Illumina but less expensive. YC companies like Airbnb and Stripe have done this basic strategy really effectively. I think you’re onto something here and I’d strongly encourage you to keep working on it and re-apply to YC in March for the June-August batch when you have developed the idea more. If I can be helpful in the meantime, please let me know. Thanks very much for flying out here from Japan to meet with us. I enjoyed meeting you and hope you’ll keep in touch. A cheap device to read and write DNA aimed at synthetic biology and DIYBio. Idea stage, in process of building proof of concept. I started developing the concept about a month ago. I’ve ordered reagents, designed PCBs and sent them out for fabrication. When will you have a prototype or beta? I’ve worked at many different (5) DNA sequencing companies at various levels, up to CTO. I feel like I have a good feel for the pain points in development and have developed a unique angle on sequencing. I think this is an instrument that every synthetic biology or DIYBio lab needs. Slow turn DNA synthesis or sequencing by an external lab. There are large sequencing companies (Illumina) and synthesis companies (Twist). No-one is targeting something very cheap. Nobody is developing a single device to read and write DNA to my knowledge. An existing synthesis company could potentially pivot into this. Someone suddenly decide to slash their sequencing costs by 1000 fold. A complete product could come out of the blue which does everything I’m considering, at the same cost, and with loads of money backing it. They want to grow the existing market. I want to build new ones. I think the global market for DNA synthesis alone could grow to ~20BUSD. I’d like to engage with the DIYBio community, and more traditional hacker spaces, and show what can be done with a read/write DNA instrument. I would engage in early access projects with synthetic biology labs. Solo founder. I have enough experience to build a proof of concept, but I will need to hire technical leadership. I will need guidance on this. I believe a decent CSO will require cofounder level equity for example (10%+). I’ve worked on everything so far. * Easy mail order water quality testing. * Using nanopore for DNA synthesis. * Offline collaboration tools for use in space. I read hackernews, you seem to treat people fairly and I think would be good people to help me get things off the ground.